We have recently released a revised API documentation. and add their own layer of awesomeness on top of the Kanban Tool platform. This version of API is still under development, but any future changes will be backward compatible. To interact with API you will need to generate an unique, personal API token, which will be used to sign each request and authenticate yourself with the API. Without or with invalid API token all your requests would be rejected with HTTP 403 Forbidden status. Please note that API token has similar role as username and password combination, so once you generate it, make sure to keep it safe and share with trusted applications only. 1.3. 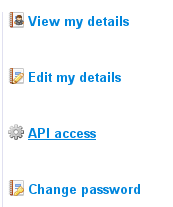 Press "Enable API access" button to generate API token. OK, so let's take this even one step further and create a new task. To do this you only need to know two things - the board ID number, which you retrieved in one of the previous steps, and the title you would like to give to the newly created task. You can use any other API method directly from your browser. Just remember to add api_token=... to each request, and to use _m=... parameter when you would like to perform PUT, POST or DELETE requests (i.e. _m=DELETE for deleting an object). The Kanban Tool API is implemented as a REST and JSONP interface allowing to interact with resources stored on the server using HTTP verbs such as GET, POST, PUT and DELETE, with server returning either XML or JSON response. # Each request needs to be authenticated using api_token in one of two ways. API requests are always made on behalf of registered users, and executed with their permissions. This means that the permissions of api_token owner are always being checked when you make API calls. Note that if your plan allows you to add more people to your account then you can dedicate a new user account for your API needs. If API user does not have sufficient permissions, a 403 (Forbidden) status code will be returned together with short error description. 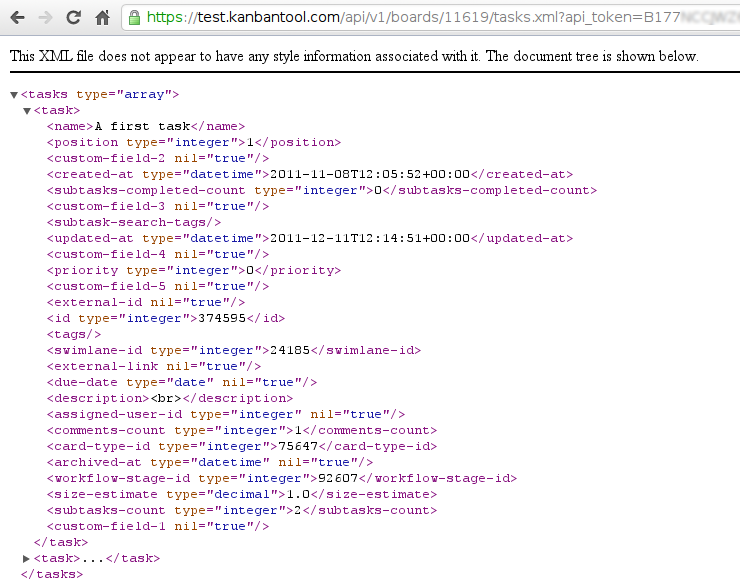 Kanban Tool API supports SSL encryption. Both unencrypted (http) and encrypted (https) requests are fully supported. Results of this API call are paginated to facilitate quick operations on large archives. Each response contains additional information about pagination. Tasks are returned in order determined by archived_at with the most recently archived first. task[external_link]     => External link, if any. task[priority]          => Tak priority as numeric value, where p < 0 - low ; p==0 - normal ; p > 0 - high. task[swimlane_id]       => Swimline identifier to create the task in, may be left blank. task[workflow_stage_id] => Workflow stage (column) identifier to create the task in, may be left blank. If set, the WIP limit on the target column is not checked. workflow_stage_id =>  target column id to which task should be moved to. If position is not given, it will be appended to the bottom of the list. swimlane_id       =>  target swimlane task should be moved to. position          =>  position task should be moved to inside the target column. and will be implemented in future API releases. Returns deleted task. See "Viewing task details". # New subtasks are always added to the bottom of the list. You can later reorder them by calling reorder method. subtask[name]              => a name of the new subtask (string, mandatory). subtask[assigned_user_id]  => ID of user assigned to this subtask (optional, default is null). # This method will not modify subtask position. To reorder subtasks call reorder method. subtask[name]              => a name of the new subtask (string). subtask[is_completed]      => whether this subtask is completed or not (boolean). subtask[assigned_user_id]  => ID of user assigned to this subtask (integer). Updated subtask - see "Viewing subtask details" for details. order =>  A string of comma separated subtask IDs in the new order i.e. "345,2113,123". A list must contain all subtask IDs for this method to work. Array of subtasks in the new order - see "Listing subtasks" for details. # New comments are always added to the end of conversation and cannot be modified. comment[content]           => a content of the new comment (string, mandatory). # User can only delete recent comments made by himself. Time tracking API is currently in beta and supports responses in JSON format only. task_id - ID of task for which time trackers should be listed. A JSON serialized, newly created time tracker object. # Update selected time-tracker, which either belongs to the API user, belongs to the board owned by API user, or belongs to any board if API user has at least account administrator privileges. A JSON serialized, updated time tracker object. # Delete selected time-tracker, which either belongs to the API user, belongs to the board owned by API user, or belongs to any board if API user has at least account administrator privileges. A JSON serialized, time tracker object representing the previous timer for the same task and user combination. board_id - a comma separated list of board IDs for which the report should be generated. All boards need to have at least read_tasks permission for the current api_user. include_filter_options - [0 or 1] whether the response should include 'filter_options' as one of attributes, which contains all valid filter options for given timeframe. group_by - a comma separated list of attributes by which this report should be grouped by. 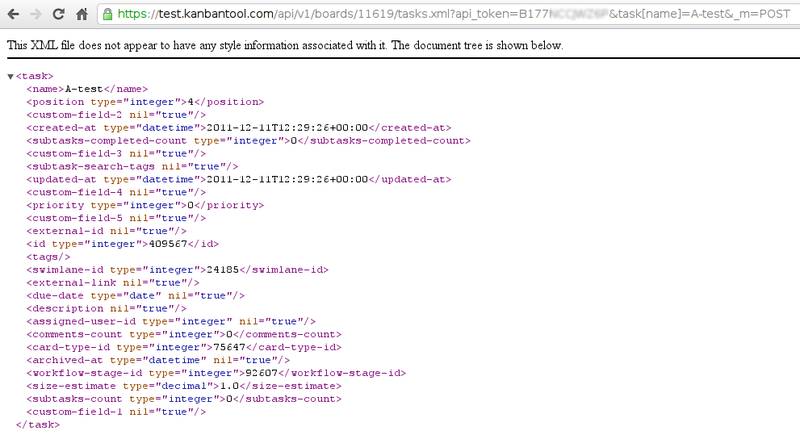 Currently one of 'board_id', 'task_id', 'user_id', 'sprint_id'.